CGP Grey is the YouTube channel name of an American-Irish educational YouTuber and podcaster who has been posting on YouTube under the channel name since 12 August 2010. Grey also posts videos on his secondary channel, CGPGrey2, and livestreams gameplay on another channel, CGP Play. His YouTube channel mainly features short explanatory videos on varying subjects, including politics, geography, economics, history, and culture. The channel's most popular video is an explanation of the terminology of the British Isles, which went viral in 2011. Grey's videos have since received increasing attention, and have been reviewed in several publications, including Business Insider and The Washington Post. In addition to video production, Grey is known for creating the audio podcast Hello Internet in 2014 with fellow educational YouTuber Brady Haran. Since 2015, he has also hosted the audio podcast Cortex with Myke Hurley of Relay FM. Along with Philipp Dettmer and Dave Wiskus, Grey started the company Standard Broadcast LLC, which provides production and administrative support to digital creators. Grey grew up in the Long Island suburbs of New York City. He went to college in upstate New York, earning two degrees – one in physics and another in sociology. His grandmother was born in Ireland, and when he was a child, his father had applied for Irish citizenship on his behalf; Grey thus has dual American–Irish citizenship. This enabled him to look into opportunities in the European Union, and its largest city, London. He later said that if he had not lived abroad while "still free of life's anchors", he never would later in life, which made it all the more reason for him to go. He attended a masters in economics program in London, and stayed in the city for more than a decade. Grey decided to become a physics teacher in the UK; he went through a one-year course to earn a physics PGCE, and graduated being qualified to teach physics in England and Wales. He taught on and off until his career as a YouTube creator became reliable. Since January 2014 he has co-hosted a general discussion podcast, Hello Internet, and began a second podcast, Cortex with Myke Hurley of Relay FM. The YouTube channel CGP Grey features, among other things, Grey Explains, a series of explanatory videos on a range of subjects, including politics, geography, economics, and British culture. The videos feature Grey narrating over animations, stock footage, and still photographs. 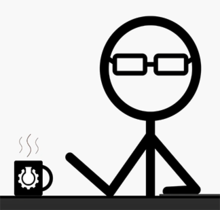 While nearly all of Grey's videos feature his voice, his face has never been shown in his videos, and Grey almost always has his face obscured when appearing in other people's videos; he generally uses a stick figure with glasses to represent himself. Grey has stated that the presentation style of his videos is influenced by that of Yahtzee Croshaw's Zero Punctuation series. Grey records his voice over the music playing in the background on Logic Pro X. The backing music of his early videos is usually credited to Kevin MacLeod. Since 2016, most videos contain music written by David Rees[disambiguation needed]. He used to use Inkscape to make the key frames of his videos and Final Cut Pro X to edit them together from 2010 to early 2016; but now he uses Adobe After Effects to do both. The switch is primarily because he now works with other animators on most of his videos, and they use After Effects. Videos are released on the channel significantly less frequently than other YouTube channels; Grey has said that this is due to thorough research and scriptwriting, with the majority of videos never being finished. Grey's video that debunks popular misconceptions has been featured on CBS, as has his video about the history of the British Royal Family. Two videos differentiate London, England and the City of London, while explaining certain oddities that arise from the ancient customs of the latter. Another two videos explaining copyright law and the Electoral College have been featured on Mashable. The channel has also explained the economic disadvantages of US one-cent coins, in a video titled Death to Pennies. Other videos, including How to Become Pope, have received media attention and used in instructional settings. Several videos under the collective name "Politics in the Animal Kingdom" explain some differences between various election procedures, and are critical of first-past-the-post voting (gerrymandering, minority rule, lack of Condorcet winner, two-party system, spoiler effect) and discuss the advantages of the alternative vote, mixed-member proportional representation, and the single transferable vote. Grey's video Humans Need Not Apply was positively covered by Business Insider and Huffington Post. In January 2014, Grey launched the podcast Hello Internet along with cohost Brady Haran, another YouTube educational content creator. The podcast peaked as the No. 1 iTunes podcast in United Kingdom, United States, Germany, Canada, and Australia. It was selected as one of Apple's best new podcasts of 2014. The Guardian included the podcast among its 50 best of 2016, naming episode 66 ("A Classic Episode") its episode of the year. The paper described the podcast as having "in-depth debates and banter that is actually amusing." Grey reported a podcast listenership of approximately "a quarter million" downloads per episode as of September 2015. The podcast has an official flag called the Nail & Gear which was chosen from five candidates with a postal vote by the podcast's audience using an alternative vote system. On 3 June 2015, Grey launched his second podcast, Cortex, with cohost Myke Hurley of Relay FM. Each episode, they discuss the methods and tools they employ to be productive and creative, and how they improve their self-employed lifestyles. Frequently revisited topics of discussion include time management, workflow automation, and Apple products. ^ "CGP Grey/about". Retrieved 18 July 2018 – via YouTube. ^ "CGPGrey2". Retrieved 23 April 2017 – via YouTube. ^ "CGPPlay". Retrieved 23 April 2017 – via YouTube. ^ C. G. P. Grey (30 January 2012). "One Year & 100,000 Subscribers Later (Thank You!)". CGP Grey. Retrieved 20 January 2013 – via YouTube. ^ a b Love, Dylan (13 August 2014). "Not Even Doctors And Lawyers Are Safe From Machines Taking Their Jobs". Business Insider. Retrieved 23 August 2014. ^ a b Aaron Blake (25 February 2013). "Why is the pope always so old? (Video)". The Washington Post. Retrieved 4 March 2013. ^ Hackett, Stephen (2 June 2015). "Introducing Relay FM's 2015 Summer Pilots". Relay FM. Retrieved 13 August 2015. ^ "About Standard". Standard.tv. Standard Broadcast LLC. Retrieved 5 May 2018. ^ "Q&A With Grey for 500,000 Subscribers". Retrieved 3 April 2017 – via YouTube. ^ "#26: Pick your Poison". Relay.FM. Retrieved 26 March 2017. ^ "Q&A With Grey #3: Millenia of Human Attention". Retrieved 26 March 2017 – via YouTube. ^ "H.I. #10: Two Dudes Talking". Retrieved 7 April 2017. ^ a b Allegra Tepper (24 July 2012). "These 10 Videos Turn Tough Topics into Child's Play, 7. C.G.P. Grey: Copyright: Forever Less One Day". Mashable. Retrieved 9 August 2012. ^ Veritasium (28 June 2012). "Science YouTubers Unite! feat. ... CGP Grey". Retrieved 26 October 2013 – via YouTube. ^ "Numbers confuse Americans – Numberphile". Numberphile (YouTube). 25 July 2013. Retrieved 7 November 2013. ^ Haran, Brady; Grey, CGP (28 May 2014). "Nobody Owns the Facts". Hello Internet (Podcast). Hellointernet.fm. Retrieved 17 June 2014. ^ Grey, C. G. P.; Hurley, Myke (14 August 2015). "Cortex #10: Zero Artistic Skills". Cortex (Podcast). Relay FM. Retrieved 16 August 2015. ^ Grey, CGP (6 April 2014). "Twitter / cgpgrey: Finally getting the hang of..." Twitter. Archived from the original on 5 March 2016. Retrieved 17 July 2014. ^ Grey, CGP; Hurley, Myke. "Cortex Episode #41: Spiralling". Relay FM. Relay FM. Retrieved 4 December 2016. ^ "Q&A with Grey No. 2 (One Million Subscribers)". CGP Grey. 20 November 2013. Retrieved 17 July 2014 – via YouTube. ^ Bailey Johnson (24 January 2012). "Eskimos do not have 100's of words for snow, and other myths debunked". CBS. Retrieved 9 August 2012. ^ Savage, Lesley (17 July 2013). "How to become a British monarch and why it won't be you". CBS. Retrieved 16 October 2016. ^ Kieth Shaw (23 July 2012). "Learn about the London inside London". IT World. Retrieved 9 August 2012. ^ Sam Gibbs (20 September 2012). "How to Become the Lord Mayor of the (Secret) City of London". Gizmodo UK. Retrieved 21 September 2012. ^ Mary Beth Quirk (13 January 2012). "The Case Against Pennies Might Make You Want To Send Yours Back To Uncle Sam For Something Useful". Consumerist. Retrieved 9 August 2012. ^ Bailey Johnson (30 November 2011). "Death to Pennies". The Feed Blog. CBS. Retrieved 4 March 2013. ^ Lindsay Jolivet (21 February 2013). "How to become pope instructional video goes viral". Yahoo! Canada. Retrieved 4 March 2013. ^ "Why Robots Will Steal Your Job, In One Brutal 15 Minute Video". HuffPost. 18 August 2014. Retrieved 3 October 2017. ^ "CGP Grey & Brady Haran – 'Hello Internet' American iTunes Chart Performance". iTunesCharts.net. Retrieved 4 July 2014. ^ Haran, Brady; Grey, CGP (29 September 2015). "Grumpy About Art". Hello Internet (Podcast). Hellointernet.fm. Retrieved 30 September 2015. ^ "Cortex". Relay.FM. Retrieved 29 March 2017. Wikimedia Commons has media related to CGP Grey. This page was last edited on 13 April 2019, at 00:16 (UTC).